Ask us about suitable solutions for your individual procurement processes. We can provide you with a web-based ordering and administration system that includes a budget control feature and a wide range of reporting facilities. This ensures optimised internal and digital workflows, while helping to make the entire procurement of information media more cost-efficient. State-of-the-art software solutions create efficient processes. Our online webshop offers a dynamic link to all common eProcurement purchasing systems and marketplaces, including SAP, Meplato Mall, Ariba Buyer, Wallmedien, Mercateo, Hubwoo and Onventis. Certified interfaces (such as SAP’s OCI) ensure fast, structured integration into your ERP systems. We can develop an appropriate technical solution for you. Just call us! 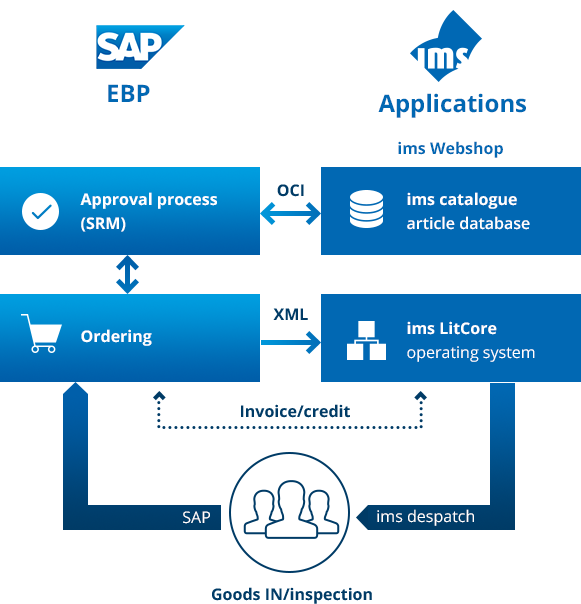 PunchOut function of the customer’s own eProcurement system incorporated into the ims catalogue; automatic user-login via PID submitted. Order transferred via OCI from the ims catalogue to the customer’s eProcurement system. Automatic transfer of the order to ims after approval (via IDoc, for example). The application of the latest technologies to the procurement of literature is essential for us. It is for this reason that we rely on competent partners who are capable of making an active joint contribution to the global developments affecting product information management and catalogue administration, with a decisive role in the shaping of future standards. We are always a step ahead, thanks to this high-performance technical grounding, and therefore able to offer new technologies at an early stage. eprocurement interfaces, Internet marketplaces, post-relational databases with Web-SSO or B2B e-commerce and e-invoicing are all part of our day-to-day activity. All our applications are hosted by a high-performance data centre located in Germany and certified to ISO 27001 standards. High-performance data access and professional data management ensure high standards of reliability and security. This allows us to guarantee not only minimised outages and the fast, reliable transfer of data, but also the protection of your data from unauthorised external access.